And for those of you who pay attention to such things ... four months later ... I have finally, FINALLY finished moving all my junk from West Virginia to my new house in Kentucky. Of course not all of it's been put away yet. And there's still tons of stuff in boxes. But hey, you gotta start somewhere. When have you made it? I read several writing blogs on a daily basis, sometimes more than just once a day. Most of those blogs are listed to the left here. But there are another half dozen blogs I check out every once in a while, and then there are times I spend an hour or so gazing around the Web for new blogs by writers, editors, wannabees, what have you. One thing I've noticed in most of the blogs by writers is that they always have goals, they are always reaching for the next level. Some beginners are just trying to get that first short story published. Other authors are trying to get that first book deal. Still others are published but trying to be able to quite their day job. And Stephen King is working toward his next million. It just seems as if it's never enough. Don't misunderstand me, because I'm saying this is a good thing (though I can see downsides). There always should be a next level for a writer to reach for, another mountain to climb, another ocean to swim. It's part of the greatness of being a writer, part of the fun. What's my next project? How will I tell this tale? What kind of different story can I come up with? But ... when have you made it as a writer? When your first book is published? When you get an agent? When Hollywood comes calling? I have my own goals, some for the near future and others for waaaaay down the road, but I'll know when I've made it. My major goal: To be able to write full time without having to hold down another job. That's just me, how I feel. Anyone else want to share their opinion? These are 29 predictions about the year 2000 made in the year 1900. The list originally came from the December 1900 issues of "The Ladies Home Journal." Some of these predictions are pretty close to reality, but the majority were waaaaay off base. The world wars alone changed so much, there is no way they could have predicted some things. Anyway, have fun. This fun little site lets you know what your blog is worth in U.S. dollars. Check out the html logo thingy below for my site's current worth. It's also interesting to check out your friends' blogs to see what they are worth; Steve Goble's site is worth a good bit more than mine, and mystery writer J.A. Konrath's Web site is worth really big bucks. Notes: This novel uses characters from the works of Robert E. Howard, especially Cormac Mac Art and Thulsa Doom. I'm a fan of Offutt's, and Howard's, so this short little novel is a natural. Mini review: About the only thing bad I can say about this book is that it jars you with too many characters right at the beginning, and it thrusts you right into a situation. So, it takes a few chapters to kind of figure out what is going on. Other than that, there's plenty of great action here for you sword & sorcery fans. And for you history buffs, you can learn a lot in this book about ancient Ireland. Notes: Been a long time since I've read any Moorcock, and thought I'd pick up this one to get me in the mood to write some action fantasy, or Sword & Sorcery. Only cost me a buck. Mini review: A bit dated as far as writing style is concerned, but that's a good thing in my opinion. Not over-the-top sword and sorcery, like Howard or Leiber, but a fun read. Moorcock tends to be more magic-oriented than most S&S writers, but that's intentional. Maybe I've been living in a bubble the last few days, but I just discovered Kurt Vonnegut passed away on April 11. This shook me up a little. I'm not a huge Vonnegut fan, having only read a couple of his books, though I did see him speak once years ago when I was in college. I feel like the last of the "real" writers has been lost to the world. Not that there aren't plenty of writers and novelists out there churning out books today, but the day of the novelist as god are over. Capote is gone. Hemingway is long gone. Salinger has had his head in the sand so long he might as well be gone. I mean no insult to modern novelists. Heck, I'm trying to be one. But novelists, or at least the way Hollywood often portrays novelists in movies, used to be respected, unique. They used to be word smiths. Now we're often asked to just be page smiths. I don't know. The publishing industry has lost something. We, as writers, have lost something. America has lost something. The world has lost something. I mentioned here recently that I sometimes hang out online in a place called Second Life. The best way I can think of to describe Second Life is, not as a game, but as a three-dimensional version of the Internet in which you are represented by an avatar of your own making. Now, Second Life has only been around for a few years, so it reminds me much of how the Internet was in the early-to-mid 1990s (for those of you who are old enough to remember that); there is a lot of information on Second Life, including business Web sites and chat and more, but there is still much room to grow. I bring all this up again here because publishers are beginning to have a presence on Second Life. There have been a few small-press and UK publishers on Second Life for a while, but Bantam Dell has recently opened a shop on Second Life, with no other than Dean Koontz doing an online session with readers. So, there might be a reason to check out Second Life. I'm predicting other publishers will start to make a move onto Second Life over the next year. I'll keep a watch on Second Life for any other writer-related news. If you should go, there are also a number of bookstores to check out. Just use the search tool and you should have no problem findng them. Notes: The author is best known for his work in the 1970s in the Executioner series of men's action novels, of which I've read many. 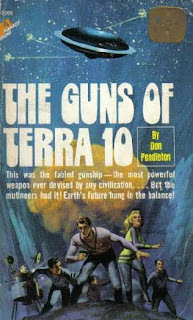 Pendleton did write some other stuff, however, and thought I'd give this sci-fi action novel a chance. Mini review: Goofy, in only the best early 70s Pendleton kind of way. Executioner fans won't find much here, other than some philosophizing, that is familiar to them, but not a bad read. The overuse of futurist jargon is a bit jarring, and it takes a while to sort of figure out what everything means, and the way the society is set up. After watching the Will Ferrell movie "Stranger Than Fiction," a question has popped into my head: Do you feel bad when you kill one of your characters? Or, do you have any emotional reaction whatsoever when you kill off a character? For me, the answer has always been "No." At least so far. There have been characters I've liked, but I've still killed them. A character's death is always planned by me. Usually the death is because it is a plot point for the ongoing story, but I have to admit I have killed a character or two because I had no further use for them and they were just cluttering up things. Is that bad? Or, at least, bad planning? Maybe. I could see a point where killing off a character might upset me, but I've yet to reach it. Dialogue can be key for a novelist, especially in today's writing field. In years past, especially pre-20th century, a writer could get away with page after page of exposition and historical facts and other so-called interesting stuff. Not today. Today, novelists need to work almost like screenwriters. Action and dialogue, those are most important. Now, I'm talking about writing popular novels, not so much literary works. I'll leave the pondering on that type of writing to college professors. But writers of the modern novel, those seeking a decent-sized audience, can't afford to meander around with much exposition and writing about feelings and the like. A few authors can get away with this, but most of those will have been around for years. No, we have to write tight. That's where action and dialogue come in. Both must move the story forward, must continue the plot, much like a movie or one of the old movie serial features like Flash Gordon or Buck Rogers. Movement is the key, movement literally and movement in dialogue. That doesn't mean every book has to be filled with nothing but fight scenes and people yacking, but it does mean the story must continue to flow. The DaVinci Code doesn't have a lot of fighting in it, but it does keep up a pretty good pace. I recently finished re-reading "The Count of Monte Cristo," the first time in a loooong time I had read that book, and something occurred to me ... is Edmund insane? I don't mean like Charles Manson insane, totally whacked out of his head, but something more akin to Hamlet, or maybe Batman. Knowing there are at least a couple of Dumas fans that peruse this blog, I officialy open this topic for discussion. Any thoughts, anyone? Notes: One of the cheap paperbacks I picked up a few weeks ago at a used book store. Only cost me a dollar. And it's from a master writing in 1953. Gots to be good. Mini review: Reads pretty old-fashioned, from a modern perspective, but still quite intense toward the end. From a modern viewpoint, most of the characters are simplistic, but you need to keep in mind the times and the people you're dealing with. A good read over all. In case you haven't noticed, there is now advertising on my blogs. I'm going to try to keep it to a minimum on this site since this is sort of my personal writing spot, but any other blogs or Web sites I handle are open to advertising. Yes, some folks would call this selling out. Some might even call me a whore. Some might just be sick and tired of all the advertising in the world. I agree, to all those things. Yes, I am selling out. Why not? It's not as if I will get rich, maybe only an extra $10 a month or even less. But I'm blogging any way, so why not make a few exra bucks at it. However, if the ads get annoying, or they cause you to have big page loading problems, please let me know. Yes, if the ads are more trouble than they are worth, I will eventually drop them. But until then, I'll keep at it. Besides, I'm a writer. We're supposed to sell out. On April 21 is the Bluegrass Festival of Books at one of my all-time favorite book stores, Joseph-Beth. I'm kind of excited about this. There are planned to be more than 80 authors there, the biggest being Paula Deen (she of the Savannah, Ga., cooking TV show fame, whom my mother adores). There are not a lot of big-name authors there, and next to no genre authors expected, but there will be a chance to talk to novelists and non-fiction writers and a few folks from the Writer's Digest books and magazine are expected to be there to talk about getting published. There are a few sessions and workshops, some free and some not, but I'm hoping to stick my nose into at least one of them. Who knows? Maybe I'll run into an agent there who will consider my stuff. Yes, the third book of my trilogy has turned out to be the toughest one to write. But it has also turned out to be the toughest to editr. For one thing, the plot is a little back and forth. What I mean is, characters are jerked around in ways they definitely don't expect, so there is some runnning around on their parts that might seem totally random at first glance. Second, is part of the subject matter. I've mentioned this before, but religion comes up in the story, which it had not done hardly in the first two books. Now, let me explain, if I can. The story doesn't become philosophical or spiritual. But religion plays a big role in the politics of some of the nations in my trilogy's world, so ... religion rears its head in my story. I'm not concsiously trying to say anything about organized religion in the story, but it's hard to ignore a humongous church that holds sway over millions of lives within my world. So, I'm not overly enjoying editing this third book. There's some weird stuff going on that goes beyond normal levels of magic in most fantasy stories. I'm working to tone down all this weirdness, but my big fear is that I'll leave the reading saying, "Huh?"